Why did the client need a Static Compactor? The client has a new distribution hub, they import fruit, decant it, sort it and re-package it for a range of large UK retailers. They generate many tonnes of waste cardboard fruit boxes. The ideal solution is a Fully Automatic Horizontal Baler but as a new start business this could not be commercially justified. They collect all the waste cardboard in Wheelie Bins (supplied by WHS) which are spread throughout The Packhouse. 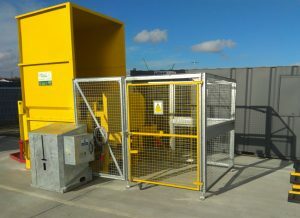 The compactor supplied has a Wheelie Bin Lifter within an interlocked safety cage. This machine reduces the volume of their cardboard by about 5:1, a Mill-Size Baling Press will reduce their cardboard volume by about 10:1 in bales weighing ~500kg. Why was the compactor painted yellow? Why did the client buy from WHS? WHS have a number of very contended clients in the fruit packing sector where we have designed and installed waste processing solutions to help maximise the cient’s recycling efficiency and minimise their waste disposal costs. As in most industrial sectors everyone knows each other and they were recommended to contact us; we visited site, submitted various options and they have started with the compactor, as the business grows they will then consider baling the cardboard boxes to increase their revenue from recycling.